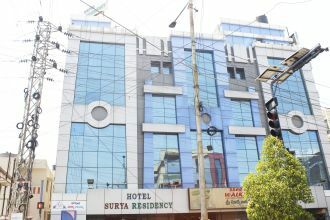 Hotel Surya Residency, this modishly designed hotel in Hyderabad is located right in the heart of business hub of the Hyderabad. The hotel boasts of 42 well-furnished and air-conditioned guestrooms to reside in. Surya Walk and Eat, a multi-cuisine restaurant serves great culinary delights to its diners while a state-of-the-art banquet hall is well-equipped with for conducting weddings and receptions.